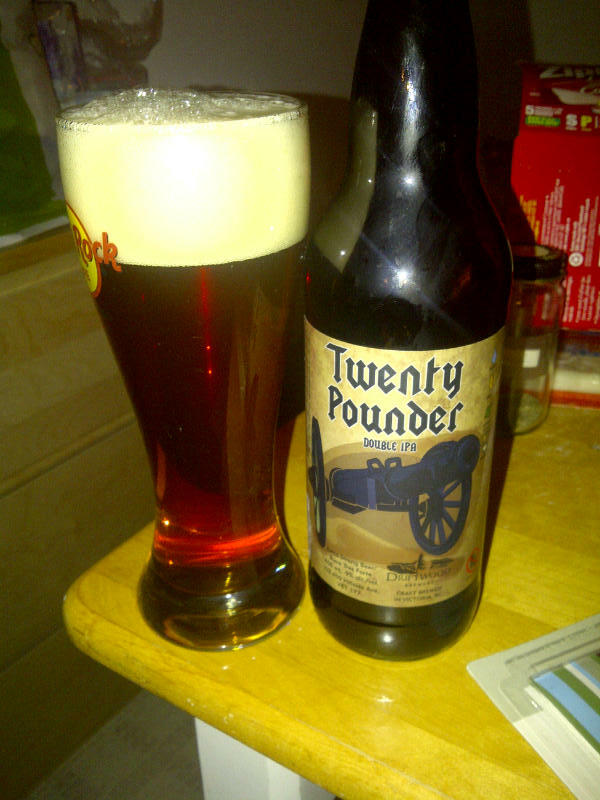 From Victoria BC’s Driftwood Brewing comes the “Twenty Pounder Double IPA” a limited release brew. The Double IPA pours a copper colour with an off white head. The aroma is of pine, citrus and floral hops. The flavour consists of huge pine, mild citrus and tons of hops bitterness. The alcohol content is 9% with a very high IBU. Commercial Description: Stand up and be counted for what you are about to receive… an explosive ordinance of IBUs! This Cascadian citrus hop bomb is sure to satisfy the most die-hard of hop heads. For those who crave hop – we salute you! This entry was posted in Double IPA, Imperial and tagged bc, bitter, bitterness, canada, citrus, double india pale ale, double ipa, driftwood brewing, hopped, hops, hopy, huge pine, india pale ale, IPA, pine, victoria. Had this delicious DIPA about a month or so back and rushed right out and bought more. It packs a punch at that ABV, so careful consumption is recommended. don’t be to careful though or you wont enjoy it as much as you should haha. What a great brew this is! Ok I can get behind that for sure! Can’t wait to try this one! I had to email Driftwood to find out where it was shipped and send Jason from jasonbeering.blogspot.ca out to buy me one! I’ll be testing that in a months time! How would you rate it compared to other DIPA’s you’ve had? I am very sure that you will like this stuff! It is a great tasting brew.